Spencer Baird, “Spencer Baird,” Histories of the National Mall, accessed April 23, 2019, http://mallhistory.org/items/show/150. Spencer Baird served as the first curator of the Smithsonian Institution and became the second Secretary of the Smithsonian. He worked at the Institution from 1850 until his death in 1887. Baird expanded and strengthened the Smithsonian's collections, and helped the young museum grow into a prominent research and educational organization. Baird devoted his career to caring for the museum's scientific collections and objects associated with the country's founding fathers. When Congress appropriated funds to create a second museum on the Mall next to the original Smithsonian Castle, Baird became its director. In 1878, he was appointed as Secretary of the Smithsonian. Spencer Baird was born in Reading, Pennsylvania in 1823. As a teenager, he and his brother William were avid birders and collectors of all types of natural objects. When he completed his studies at Dickinson College in 1840, Baird was already in correspondence with one of the foremost ornithologists of the day, John James Audubon. Baird briefly lived in New York City, where he was supposed to be studying medicine, but actually spent most of his time studying drawing with Audubon. By 1843, he decided to be a professional naturalist and returned to Dickson to teach natural history and serve as curator of the Natural History Cabinet. In 1846 he married Mary Helen Churchill. That same year, he received the first grant ever given by the Smithsonian Institution, which allowed him to explore the natural history of southeastern Pennsylvania. 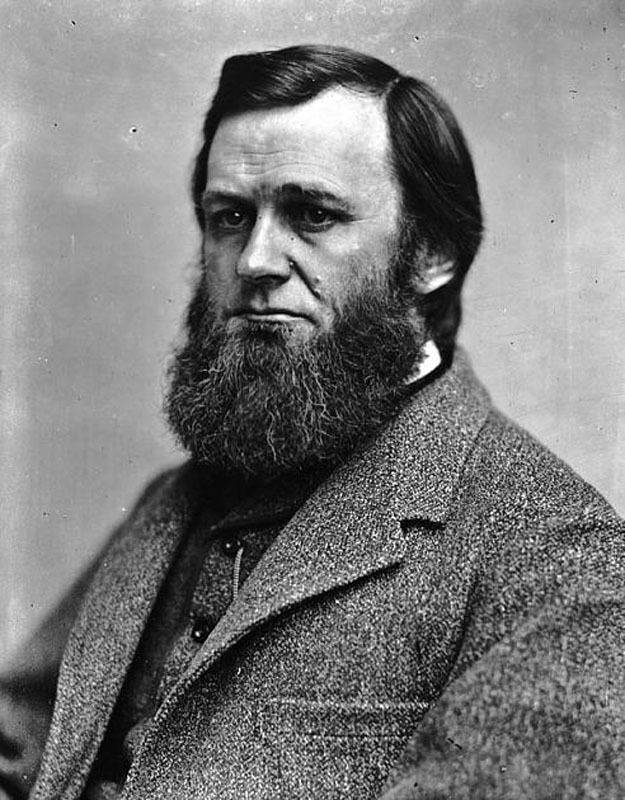 In 1850, Baird accepted a position as first curator and as Assistant Secretary of the Smithsonian Institution. Together with his family, he brought two railroad cars full of his personal natural history collections to Washington. Baird coordinated the Smithsonian’s exhibits at the 1876 Centennial Exposition in Philadelphia. It was the success of this public exhibition that helped him to convince Congress to fund the construction of a new National Museum as part of the Smithsonian, which had been primarily a scientific research institution. As a specialist in birds and fish, Baird was appointed as the first Commissioner of the United States Fish Commission also located on the National Mall. The Commission’s work included efforts to restock rivers with native fish species and to stabilize fish populations. Seven years later, in 1878, he was elected to serve as the second Secretary of the Smithsonian, following the death of the first Secretary, Joseph Henry. During Baird’s tenure as Secretary, the National Museum opened, the Bureau of American Ethnology was established, and the Department of Living Animals began showing animals behind the Castle, and later in the new National Zoological Park. Baird retired in 1878 due to illness and died a few months later.